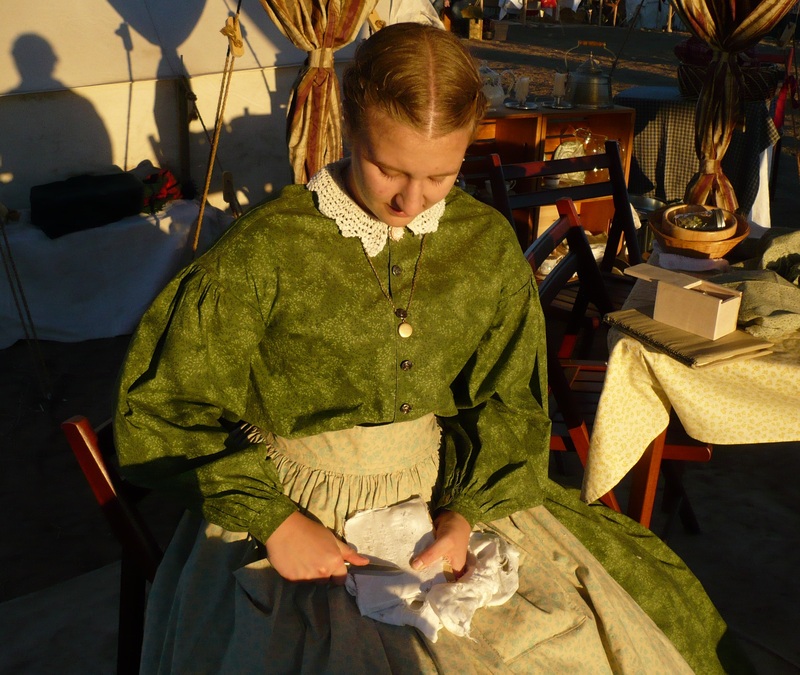 At Civil War re-enactments, rolling bandages, scraping lint, sewing sponges, and sometimes even sewing or knitting opens a conversation, and I rejoice in the opportunity to share a lady’s role in the American conflict through my first-person interpretation. A lot of folks come to re-enactments with the idea that the majority of women disguised themselves and enlisted as soldiers, sneaked around as spies, or spent a lot of time in the military camps. It’s part of my job to dispel those myths and that’s why I study, write about, and portray a civilian lady. The vast majority of the ladies of the Civil War era stayed home, running the family business, ploughing the fields, looking after the children, watching and waiting for their loved one’s return. The revered ideal of feminine grace carried into the war years and ladies maintained their role as homemaker, wife, mother or daughter at home even in the midst of great hardship or fear. With a caring heart attitude and a desire to provide, the ladies of the North and South joined together and accomplished a variety of tasks. The soldiers may have been fighting on distant battlefields, but they were wearing the uniforms, carrying the flags, enjoying the food, and reading the morale-lifting letters sent from the ladies at home. A patriotic desire combined with the practiced self-less actions, prompted the ladies to make their contribution to the war effort. Supplying the armies with clothing, food, and bandages was not an easy task, but the ladies accomplished it. But they also accomplished something more than meeting the basic needs – they gave the men a reason to fight. Soldiers from the North and South both acknowledged that they were defending their loved ones or their future. It’s time to start re-interpreting the traditional role of comforter and homemaker that the ladies of the Civil War adopted. Contrary to popular belief, the majority did not run out and find uniforms. They waited, watched, and worked quietly at home, maintain and adapting their traditional role to meet the war crisis as they patriotically supported the armies by doing the work to the provide the supplies and keeping up morale. The ladies of the Civil War have left us with a clear example of women successfully influencing and supporting a cause from the doorstep of her home. P.S. Who is your favorite lady of the Civil War era? Why? Previous Why Do We Ignore Gettysburg Civilians?